The report provides plenty of valuable data points for the industry, both of records of recent history and predictions of the near future. For example, despite the expected fast growth of 5G, by 2022, 4G will continue to dominate both the number of connections and the data generated. 54% of total connections will be on 4G, which will generate 71% of total mobile data traffic. Mobile data traffic will represent 20% of all IP traffic by 2022. With regard to data traffic by individual devices, on average a smartphone will generate 11 GB of traffic per month by 2022, up from 2GB in 2017. Mobile video will be responsible for even higher proportion of the total traffic. 59% of the total mobile data was video in 2017. This number will grow up to 79% by 2022, and the absolute data volume of mobile video will increase by nine times. The report identifies seven key global mobile networking trends, from Cisco’s perspective. Evolving toward Smarter Mobile Devices: this largely refers to the high and increasing percentage of smartphones, including phablets, in all the connected devices (from 50% to 54%), as well as the fast growth of M2M connections (from 11% to 31%). Main segment losing out will be non-smartphones (from 34% to 10%). Defining Cell Network Advances: this trend refers to the accelerated growth of mobile connections on newer technologies (4G and 5G) in contrast to the fast decline of the number of 2G connections and the gradual decline of 3G connections. Another fast-growing segment is M2M on Low-Power Wide-Area (LPWA) networks, increasing from 130 million in 2017 to 1.8 billion by 2022. Measuring Mobile IoT Adoption: captured in this trend is the continued growth of M2M and wearable connections. Globally, M2M connections will grow from just under 1 billion in 2017 to 3.9 billion by 2022, a CAGR of 32%. Wearables are treated as a subset of M2M connections by Cisco. The report forecasts 1.1 billion wearable devices globally by 2022, more than double the volume of 526 million in 2017, with a CAGR of 16%. Among them, 10% will have embedded cellular connectivity, up from 4% in 2017. Expanding Role and Coverage of Wi-Fi: the volume of mobile data may be big, but the volume of mobile data going through Wi-Fi offload is even bigger. The report forecasts that 59% of all data from mobile connected devices will be offloaded to Wi-Fi in 2022, amounting to 111.4 exabytes per month, up from 54% offload, or 13.4 exabytes per month in 2017. To enable the fast growth of offload data volume, the report forecasts, there will also need to have much more Wi-Fi hotspots. It estimates that Wi-Fi hotspots (including homespots) will grow from 124 million in 2017 to 549 million by 2022. Identifying New Mobile Applications and Requirements: in addition to video being the application category that generates the lion’s share of total mobile data traffic, VR, AR and Mixed Reality are also expected to experience a fast growth in the coming years. Globally, augmented and virtual reality traffic will grow from 22 petabytes per month in 2017 to 254 petabytes per month in 2022. Comparing Mobile Network Speed Improvements: the speed of mobile data is determined by both the networks and devices. In particular with the accelerated 5G rollout in the forecast period, the report expects to see the average speed of mobile network connection to increase from 8.7 Mbps in 2017 to 41.6 Mbps in 2022. The speeds also vary vastly between technologies. 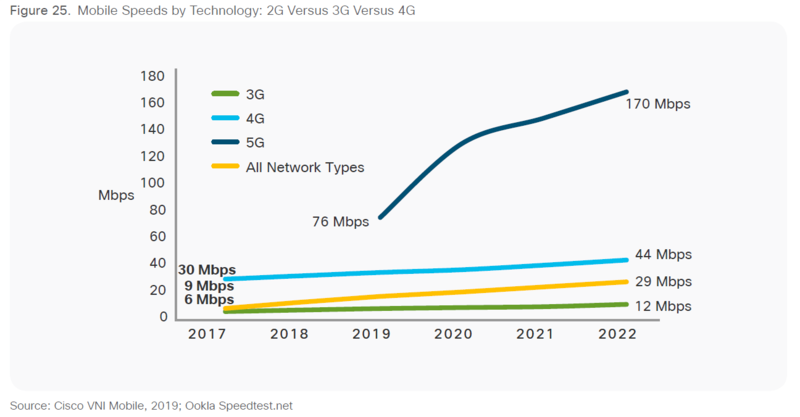 While the average 4G speed is expected to grow from 30 Mbps in 2017 to 44 Mbps in 2022, the average 5G speed will increase from 76 Mbps in 2019 to 170 Mbps in 2022. Reviewing Tiered Pricing, Unlimited Data and Shared Plans: the final trend examines what impact operators’ data packages and tiered pricing schemes will have on customers’ data consumption patterns. One interesting finding is that, a combined effect of all users increasing their data usage and more operators reintroducing data package cap has driven the proportion of data generated by the top 1% of users down from 52% in 2010 to only 6% in 2018. The Visual Networking Index is produced by combining Cisco’s proprietary data and assumptions with that published by professional research firms as well as by the ITU. 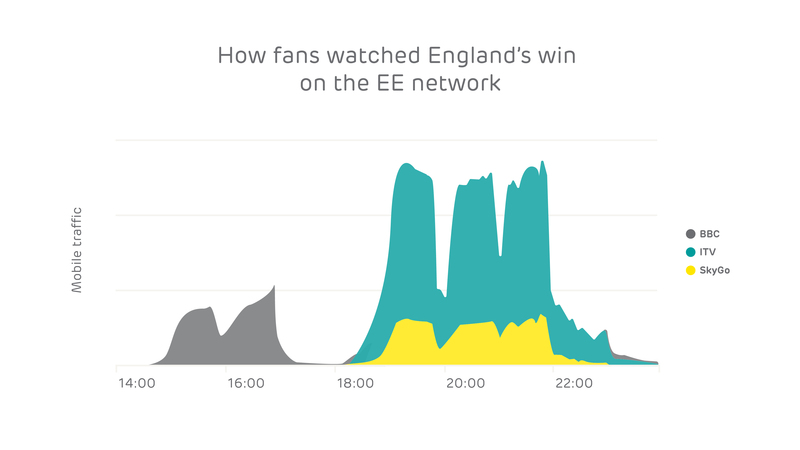 EE reported sharp drop in broadband traffic when World Cup matches are on, while ITV registered the highest viewership on England’s match against Colombia. 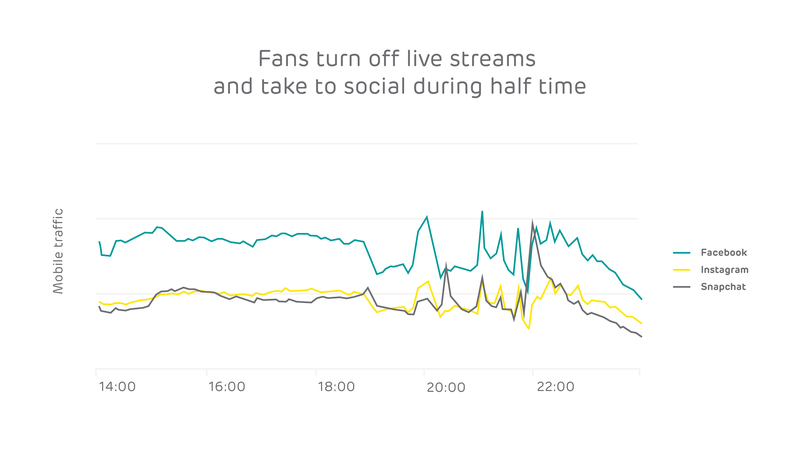 A few factors may have contributed to the lower traffic registered during the Sweden vs. Switzerland match: it was still office hours therefore fewer people were out in the street; when streaming indoor the traffic would more likely go through Wi-Fi; and the relatively weaker following by the general public. When the England vs. Colombia match was played, a World Cup record of 23.6 million watched it on ITV at home (the number of those watching in pubs are not available). The mobile traffic pattern also followed closely the progress of the match: peaks at the beginning of the match and the penalty shootout, canyons at half time, 90 minutes, then off the cliff after the last penalty was kicked (and scored). An interesting data point is that around 1/5 of viewers watched the ITV live streaming through the Sky Go aggregator, despite that ITV Hub is free to all, as is the BBC iPlayer. An eye-catching anomaly on the chart is that, right after the match was finished, the traffic generated by Snapchat overtook that by Facebook. As Snap users tend to be younger, this may serve as a reminder to Facebook that it may not be the default platform by the next generation internet users when they share their feelings. Now the nation is increasingly excited with England in the quarterfinals for the first time since 2006, the match against Sweden, played next Saturday, will almost guarantee to generate higher mobile traffic and viewership, this time on the BBC. In a move disturbingly in keeping with the times EE has launched a new service that allows subscribers to give their kids just what they’ve always wanted. Gone are the days when junior might have asked for a new bike or a train set or some other wholesomely analogue toy. It’s all about data these days and EE knows it, so it has launched what it claims is the UK’s first data gifting service. It fundamentally seems to be a tweak to the concept of a ‘family plan’ in which everyone has their own basic data allowance but if junior has been hitting YouTube hard on the way home from school and anyone else in the family has a surplus they can recycle their data in a show of digital benevolence. This seems to be a good compromise towards totally shared data buckets, which run the risk of careless streaming leaving the whole family data-less until the end of the month. The transfer is done through the EE app and, judging by the images above, is pretty straightforward. Call us old fuddy-duddies if you will but there is something slightly disturbing about using data as the basis for parental Pavlovian reward systems, as it seems to present staring at a screen as the ultimate youthful aspiration. Having said that the genie is definitely already out of the bottle when it comes to kids and devices so maybe we should just resign ourselves to it, just as EE apparently has. Mobile data services outfit BICS has published its data for 2017 and it reveals some interesting trends in LTE consumption. 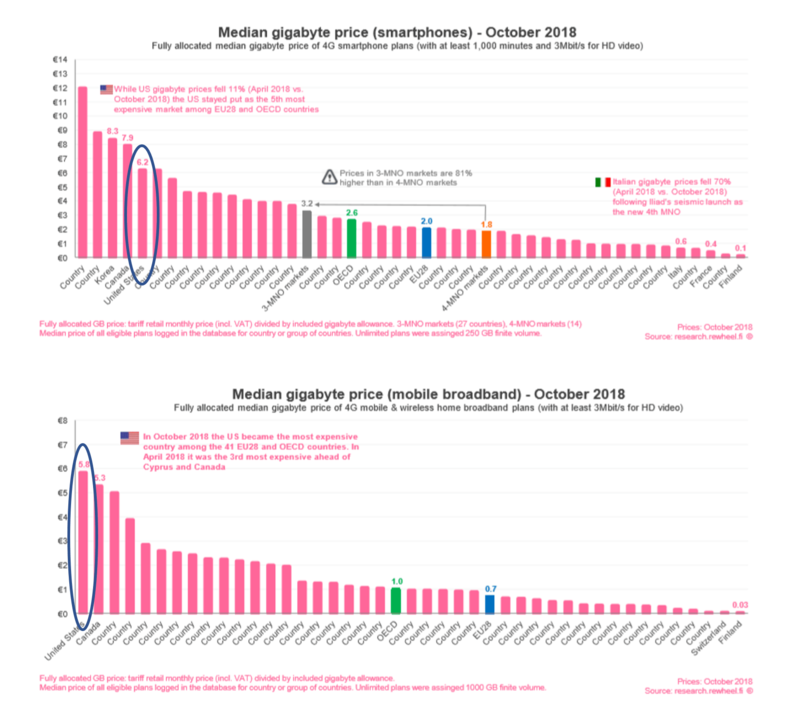 The most dramatic data point is an 800% year-on-year increase in LTE data roaming traffic in the EU, apparently driven by the ‘roam like at home’ abolition of roaming charges between EU countries. Furthermore BICS reckons a significant minority of people still haven’t taken advantage of this opportunity so it expects a further increase this year. The bigger picture revealed an annual doubling of global LTE traffic thanks partly to more operators getting the LTE memo, but presumably also to the underlying trends of mobile video streaming, more generous tariffs, etc. Africa seems to be getting up to speed with LTE too. “As infrastructure improves and populations and workforces become more globalised, we’ll see an even greater number of operators across the world offering LTE roaming to ensure they stay relevant and competitive,” said Mikaël Schachne, VP of Mobility Solutions at BICS. “Roam like at home has upped consumer expectations for high quality, affordable roaming services, wherever they travel. Operators in other regions will therefore look to emulate a similar situation this year by banding together to offer better packages to subscribers while optimising traffic flow and cost efficiencies at the back-end. It goes without saying that the BICS release also featured lots of commentary on how great BICS is, how well it’s positioned to facilitate all this lovely roaming, etc. With LTE still in such a rapid growth phase all the hype around 5G is put very firmly in perspective. There is clearly plenty to be done with 4G before we go up one more.